Laugh & Learn® Froggy helps baby grow by leaps, teaching shapes, colors and numbers with over 20 sing-along songs, words & phrases! 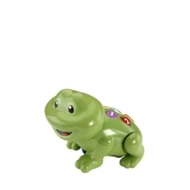 You can count on Fisher-Price® Laugh & Learn® Count With Me Froggy to help give baby a “jump” on shapes, numbers and colors…and motor skill development, too! Five big, colorful buttons on Froggy’s back respond to baby’s touch with over 20 sing-along songs, tunes & phrases that introduce baby to shapes, plus colors and numbers in English and Spanish. 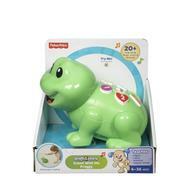 Baby is also rewarded with fun songs, phrases and “hopping” leg action for pushing Froggy across the floor, encouraging baby to push and crawl along!